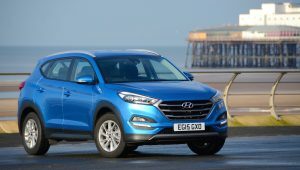 The Hyundai Tucson is a competent all-rounder that looks good and is easy to live with, but as with all SUVs, real-life economy – especially at motorway speeds – is not helped by its body shape. Yes, it’s yet another SUV, because seemingly everyone wants an SUV. 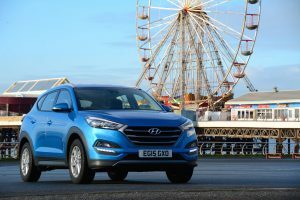 The Tucson replaces the ix35, and although you can specify four-wheel drive, our test car was just front-wheel drive – which is what most people are likely to opt for. We think that the Tucson looks good overall. 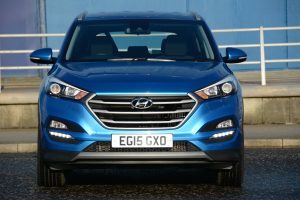 The frontal styling has more impact and presence than the ix35 that it replaces, and the rest of the car isn’t something that you’d be embarrassed about having on your drive. 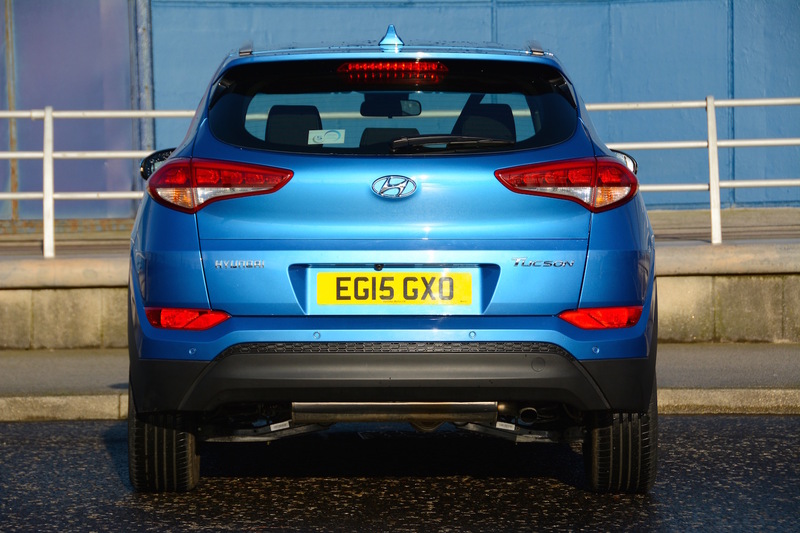 The blue colour of our test car certainly helped the Tucson to stand out. 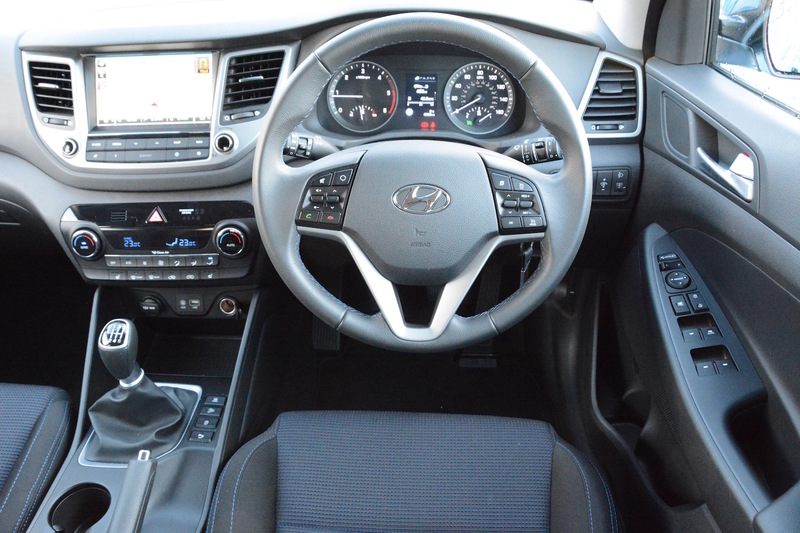 If you’re used to recent Hyundai interiors, then there’ll be no surprises inside. The dashboard looks stylish, is well laid-out, and has large, clear buttons, and lots of controls on the steering wheel. The driving position is good, helped by the steering column having a decent amount of adjustment. There’s even a generous amount of rear legroom. Our test car was a 116PS 1.7-litre diesel with front-wheel drive and a 6-speed manual gearbox. Overall, the Tucson’s driving dynamics are perfectly acceptable. It’s easy to drive, the ride is comfortable, there’s not too much roll in the handling department, and it’s generally fine on the motorway. Like many modern cars, there can be some tyre noise on certain poor quality motorway surfaces. 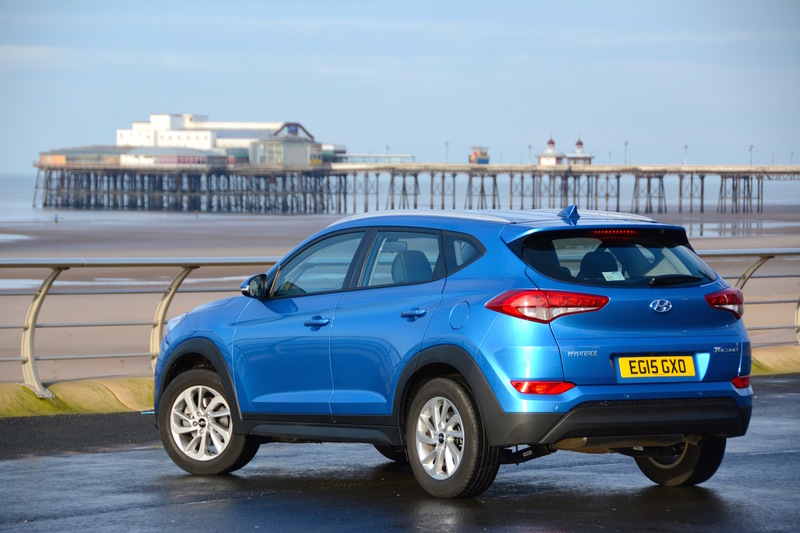 And this Tucson is front-wheel drive with a 1.7-litre diesel engine, so best not to expect many driving thrills. The diesel engine can sound noisy when cold, and at low speeds. And although it’s happy at constant progress on a motorway, if you want to overtake at these sort of speeds, you’ll need to drop down a number of gears to get any decent acceleration. And while we’re on the subject of gears, it was easy to select third gear rather than first with the manual gearbox – more spring assistance may be helpful to direct the lever more easily into first. In keeping with the overall dashboard design, the satnav is easy to use and is very clear – especially the graphics that appear on screen to direct you at junctions. However our normal touchscreen comments apply: having to reach over and touch buttons on a screen when driving at speed is never a good thing in our view. The theme continues: the Tucson put on a decent show in the area of economy – but it wasn’t outstanding. The official NEDC economy figure is 61.7mpg (equating to 119g/km CO2). Until recently, this would have been a respectable figure for this size of SUV. However cars such as the Renault Kadjar now have official economy figures in the 70’s. After a week with the Tucson we averaged 43.5mpg. As usual, this is way down on the official figure. 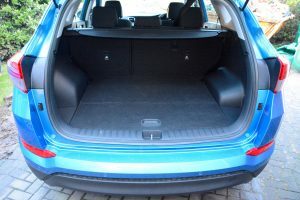 As regular visitors to Green Car Guide will be aware, we find that cars with good aerodynamics perform well in our real-life economy measurements, as our driving contains a reasonable proportion of motorway miles. As speed doubles, the drag increases by a factor of four. 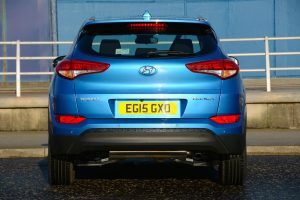 Although car buyers seem to like the prospect of driving an SUV, most SUVs have a large frontal area, which isn’t helpful for real-life fuel economy, especially on the motorway at 70mph. So if you’re looking for an SUV, be aware that other cars out there will have better aerodynamics and therefore better real-life fuel economy. Despite the average economy, the Tucson still promises a driving range of well over 500 miles on one tank – something that electric cars can’t come close to. The Hyundai Tucson SE Nav 1.7 CRDi 116PS costs £23,145. Rather than undercutting European rivals, it sits in a similar space. However equipment levels on the Tucson are better than some competitors. The 1.7 CRDi 116PS Blue Drive as tested only comes in two-wheel drive form. There’s a 2.0 CRDi 136PS which is two-wheel drive, and there’s a four-wheel drive version with manual or automatic transmission. There’s also a 2.0 CRDi 185PS which is only available with four-wheel drive, and with manual or automatic transmission. There’s one petrol, the 1.6 GDi 132PS Blue Drive 2WD ISG Manual. The Tucson is available in S, SE, SE Nav, Premium and Premium SE trims. 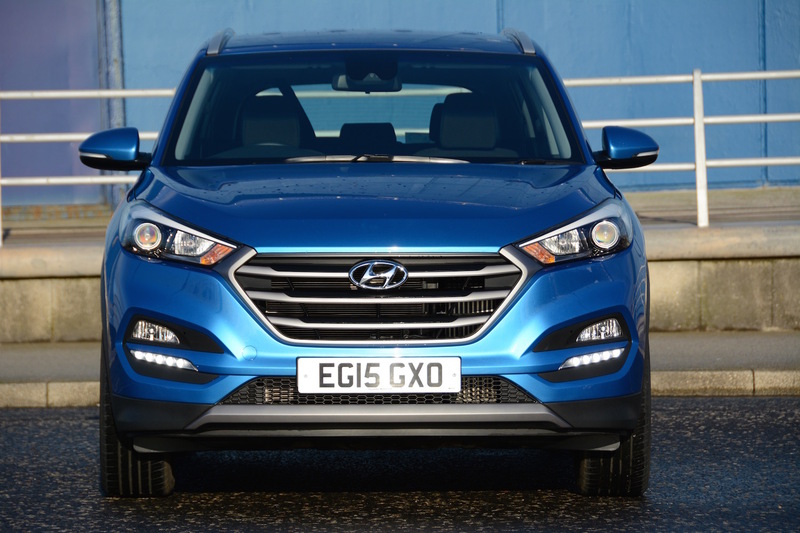 For many car buyers, the Hyundai Tucson offers an appealing package. It looks good on the outside and the inside, and it’s decent to drive. With the 1.7-litre diesel engine, both performance and economy are adequate. 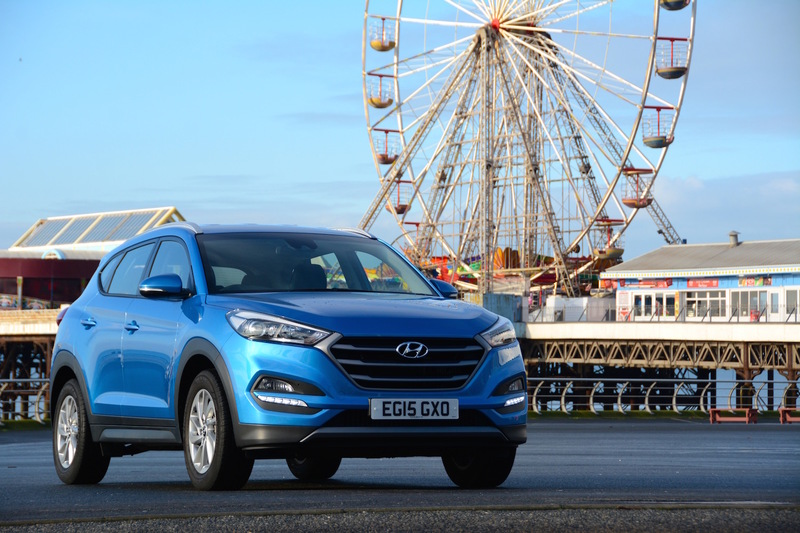 The Tucson’s pricing is competitive, and Hyundai offers an attractive five-year, unlimited mileage warranty. That might be enough to swing a buying decision for many people. 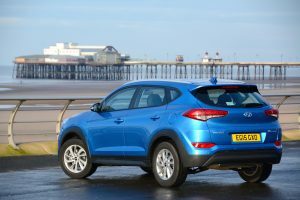 However the Tucson doesn’t really excel in any particular area, which means that some drivers may find it hard to get excited about it. 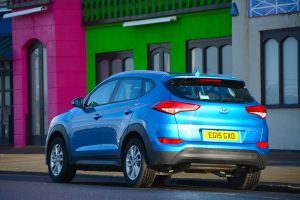 And if you’re looking for a genuinely green car, then the aerodynamics of any SUV such as the Tucson will mean that many other cars will be more economical if a high proportion of miles are driven at motorway speeds. 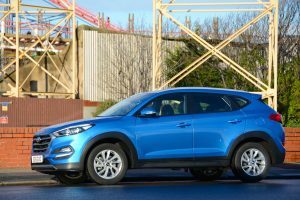 The result of all this is that the Hyundai Tucson gains a Green Car Guide rating of 8 out of 10.